Many thanks to David Goren, who has apprised me of a (utility?) broadcaster who relaying Spanish language football matches on 12,365 kHz in the upper sideband. According to a message on the DXLD Yahoo group, someone has been relaying games on this frequency with some consistency. As I type this, I’m listening to Chile v Mexico, though it’s a very faint signal here in eastern North America. 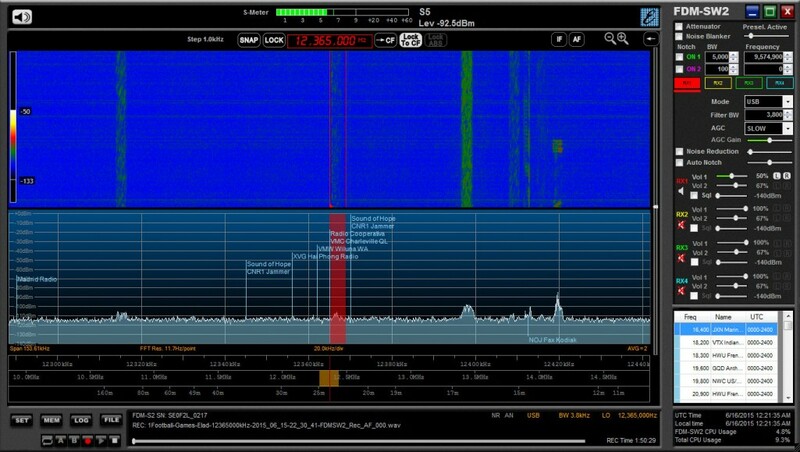 The Elad FDM-S2 is doing a good job of pulling the signal out of the static, though. I have no clue where this broadcast originates. Please comment if you’re able to log this station where you live, or you have further details about the relay. This entry was posted in Broadcasters, News, Shortwave Radio, Sports, What's On Shortwave and tagged 12356 kHz, Football, Soccer on June 15, 2015 by Thomas. As an aside this may be of interest http://www.nws.noaa.gov/os/marine/rfax.pdf scroll down to Kyodo News Agency. They have sporting info in amongst their fax news output. That’s exactly what I was thinking: someone relaying the games for their fishing fleets. I imagine this is being done without the consent of the network behind the games, which makes it feel much more like a pirate station.